This question, which often follows the painful, “Where are you from? No, where are you really from?” interrogation that was recently demonstrated by Donald Trump, is familiar to literally every Korean who ventures into the English-speaking world. It is usually accompanied by sniggering and the satisfaction of a punchline well-delivered. Being an immigrant kid comes with many challenges, one of which is discovering and settling into one’s identity at the crossroads of cultures. When I was at the very start of my journey, this question used to make me vaguely uneasy. Nobody, least of all an awkward adolescent who just wants to fit in, likes to be associated with a country that seems to be synonymous with chronic famine, ridiculous displays of military extravagance and according to the corniest comedians – the world’s most caricature-worthy dictator. I always felt a bit embarrassed, as if the failings of the Kim dynasty were somehow, indirectly, a personal failing. However, as I continued to learn about the history of both my home and my motherland; about empire-building and colonialism, and the way these events shape the present, I started to question why North Korea, and by extension the ongoing stalemate on the Korean peninsula was perceived as a joke by so many people I met. Why was it funny that my motherland had been divided for so long that families that had been separated by a matter of hours and a couple of metres had lived and died during this time? The questions became more pressing as I looked closer. The Korean people did not choose to go to war or be separated. 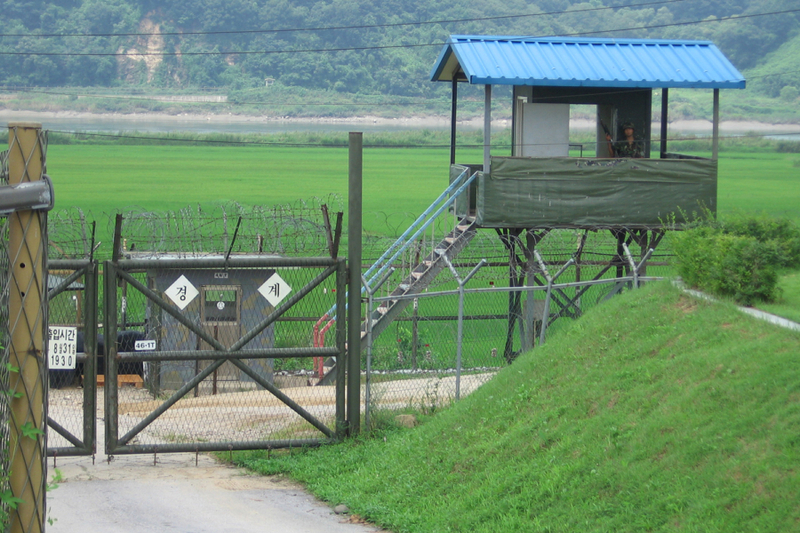 Where was our sovereignty when the barbed wire and landmines were installed, and why does it feel like the possibility of peace has always been in the hands of other countries? For me, the answers to these questions have come from a mix of historical and cultural resources that tap into both the facts and the lived experience of the last century of Korean history. In the first half of the 20th century, Korea went from a kingdom, to a Japanese colony (with the tacit approval of England and America), to its current state. Jo Jung-Rae’s seminal historical epic ‘The Taebaek Mountain Range’ describes the experience of ordinary citizens during this tumultuous time, the overwhelming joy of independence and the horror of seeing a local government official who had terrorised them under the colonial Japanese government, riding towards them on an US army Jeep as a newly-hired interpreter a few days later. The separation of families by the distance of a footbridge, or an overloaded boat during this period has since been re-enacted in countless films and television shows. The fact that the story of division remains compelling after so many retellings is a testament to the depth of trauma that this time inflicted on the population. Since then, the people of North Korea have been in the grip of a self-serving dynasty, while in the South, the people have fought to bring down a series of dictatorships and one almost-dynasty to achieve an imperfect but admirable democracy. Throughout it all, the dream of peace and unification has always been at the centre of our national consciousness and echoed by our heroes. His contemporary and fellow independence activist Ahn Jung-Geun also criticised the imperial tendencies of the ‘western powers’ and proposed a shared vision for peace in the East. Even more remarkable, in my view, is the way in which the survivors of Japanese military sexual slavery transformed their trauma into a global network of activists, working to end war-time sexual violence against women and to help bring about peace. For most Koreans, living physically or spiritually next-door to a potential warzone, peace is a necessity, and peace on the Korean peninsula is at the heart of achieving peace, both in the region and world. Take a minute to search for ‘Finding Dispersed Families’ on YouTube. This was a TV show that ran live for 138 consecutive days in 1983 and broadcast hundreds of hours of people searching for and finding loved ones that they had lost in the war. Behind the missile launches, sanctions and lame jokes, this is the human impact of the current freeze of diplomatic relations. The generation who remember their separation from their families is now much older and time is running out for them. If we do not achieve reunification within their lifetimes, we will have missed the opportunity to attain one of the most meaningful aspects of reunification. The situation on the Korean peninsula has been on the world’s mind again with a steep rise in the number of missile tests over the last year, the bumbling approach of the current American government and most recently with a thawing of diplomatic relations leading up to the Pyeongchang Winter Olympics. Unfortunately, these subtleties rarely reach English-speaking audiences. The way that these events play out in western popular culture, whether intentional or as an evasive manoeuvre to avoid the gravity of the consequences, is overwhelmingly tokenistic and superficial, with the worst examples exploiting the controversial nature of the situation for publicity. Thoughtful analysis, such as this opinion piece by Korean novelist Han Kang, are rare. Current president Moon Jae-In’s administration’s unification policies represent a break from the oppositional stance of the two previous governments and puts forward a Korean-led process as the first of their guiding principles. As President Moon said in an address on the 72nd Anniversary of Liberation last year, “The division of the nation is the unfortunate legacy of the colonial era that made it impossible for us to determine our destiny on our own in the midst of cold war rivalries… We, with our own strength, have to achieve peace on the Korean Peninsula and overcome the division.” The new policy also commits to breaking the cycle of sanctions and provocations and prioritises peace. In the context of this shift in policy and the diplomatic opportunities offered by the Olympics, it is a time of hope. The day before I began writing this piece, it was confirmed that North Korean athletes would be attending, and both Korean teams would enter the opening ceremony together, under a flag representing a united Korea. And behind the scenes, a phone line between the two governments have been reconnected after two years of silence, and long-closed roads have been reopened. There are whispers about the potential for another road of family reunions, which have been on hold since 2015. So far there have been smiling selfies and athletes in the joint team throwing each other birthday parties. Koreans on either side of the divide have cheered for the joint women’s ice hockey team. I wonder if these small signs of progress will be able to break through the stereotypes and unhelpful framing that has always been used to discuss inter-Korean relations. What makes me hopeful is the language of self-determination within the new South Korean government’s policy and the resolve of South Koreans across the political and social spectrum to make the most of this opportunity for peace, still buoyed up by the afterglow of the Candlelight Revolution and subsequent change in government. It is with great anticipation that we wait to see how much can be made of this opportunity – both towards reunification and updated paradigms of what it means to be Korean to replace the Cold War-era clichés.